It is my pleasure and edification to read, review and implement the lessons from The Art of Sewing Collection by Time Life Books; copyrights from 1973-1976.
and of course, an Index. I will be starting with Volume 1: The Classic Techniques. If anyone would like to join me, I'm certain volumes can be had rather cheaply via Ebay or Abe's Books. (www.abebooks.com). My German grandmother had a set of these books. I remember them very clearly when my mom brought them home with her Pfaff after her death. My Oma lived in Ohio and I did not see her very often. My mother worked full time so no one taught me to sew. I could not figure out the Pfaff machine. I think my mom sold it or gave it away. It wasn't until I was grown and had a family of my own did I learn to sew. However, I often daydreamed of making clothes and home items while growing up. It is a pity as my Oma was very talented. So these books found their way back into my life after finding a volume at a thrift store. I immediately recognized it and then searched on ebay, finding a lovely full set. Whether you have only dreamed of creating beautiful thigs, or your're an expert at sewing and other needlecraft, you will discover hundreds of inspiring ideas and professional instruction in this beautiful, practical, comprehensive new series of books. Not until now has there been so complete a source of creative ideas for machine and hand sewing, knitting, crocheting, needlepoint, embroidery, macrame', applique' . . . every kind of stitchery you can think of . . . with step by step instructions to show you how. This unique new series of books will be as beautiful to look at as they are practical to use--from the elegant fabric covers to the large full-color photographs, and the thoroughly detailed directions within. The step-by-step instructions, acccompanied by crystal-clear, photographs, drawings and diagrams teach you exactly how to master all the basic methods and fine points of sewing and needlecraft used by professionals--to get really exciting results for your time and effort . . . the best results you could wish for . . . the results you want without spending a fortune. The covers are very cool, all fabric covered somewhat topical to their subject. 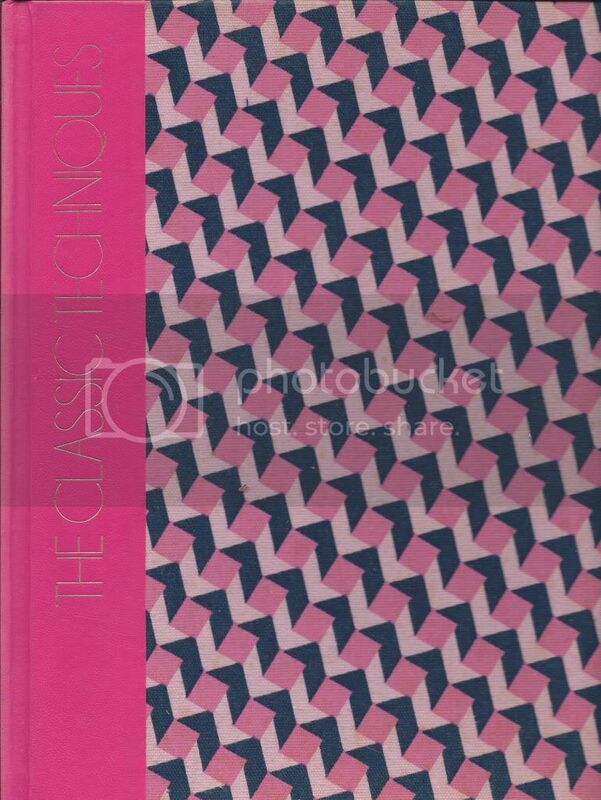 The first volume is covered in a hot pink, black, white mod patterned twill. Wow! I never knew that Time-Life did a sewing series. I shall read your blog with interest. Found your blog via google looking for these books! I found three of them at a thrift store today, now I know I 13 more to go! Great blog!